UPDATE DECEMBER 16, 2015 - The FBI has now identified a man who was "also involved" in the robbery. Details HERE. 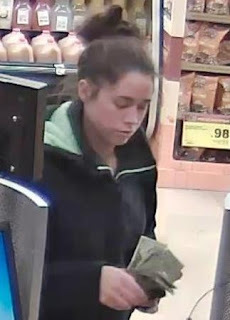 Police are looking for a woman who robbed the Uptown TCF Bank at 4355 N. Sheridan Road on December 10. Investigators say the offender approached a teller at the bank around 5:20 p.m. and demanded cash. She then fled southbound from the bank, which is located inside a Jewel-Osco store. No weapon was seen during the hold-up. An FBI alert describes the suspect as a white woman in her early 20’s to early 30’s. She is 5-feet-2-inches to 5-feet-7-inches tall and has a slender to medium build. Since 2014, TCF Bank branches located within Jewel-Osco stores have been robbed ten times in the 19th police district. The 4355 N. Sheridan location has been hit four times. The Boystown location at Broadway and Addison has been robbed three times. All of the offenders were eventually arrested—except the one pictured here, of course. And her time is limited.